Landing here simply means you are making up your mind to buy the marvelous Breville BES870XL Barista Express! 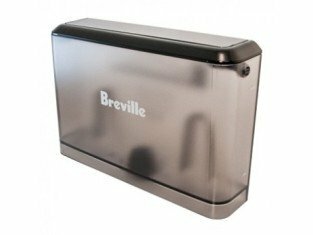 It’s one of the greatest product from Breville so far. We’ve tried to provide as much detail as possible for a person to make a wise decision as whether to buy it or not. Let’s go ahead. Shopping for an all in one espresso brewing system can be somewhat of a daunting task. The price factor, a major one can even switch a coffee drinker to tea. Another factor is usage, which is even worse -some systems are so computerized that you need to work for NASA to be able to use them. Fortunately, Breville has recognized the need for a reliable, yet simple all in one espresso brewing system. The machine we are talking about here offers top quality espresso beverages without the science of other models. With the Barista Express, you can enjoy the art of beverage making, just like a real barista! The Breville Barista Express is a perfect balance of simplicity and versatility. The fully manual nature of the machine eliminates all of the complicated computer features of other models. Gone are the complex interfaces and programming hassles of higher-end machines. Another upgraded model is 920xl by the same brand. If you have a little more money, you can check it out too! However, the Barista Express offers a surprising range of versatility in spite of its simple design. Choose the grind setting for your beans, as well as the temperature and volume of your espresso shots. This is the machine that offers customizable beverages with total simplicity and ease. Most all in one brewing systems take a hit for their built-in grinders. This Breville espresso machine, however, is a pleasant exception to this rule. 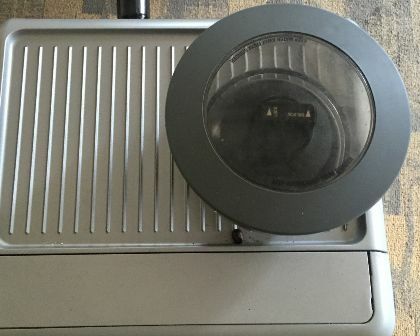 The built-in conical burr grinder in this unit is removable, allowing for proper cleaning. This means that you can use any coffee beans whatsoever, including those that are oil rich. Normally, dark roast beans need to be avoided to prevent burr grinders getting ‘gunked up’ with coffee oil residue. No such restrictions are needed here since you can remove the grinder and clean off any oil and grime. Thus, the Barista Express has a significant advantage over many of its higher-end counterparts. The high capacity 67-ounce water reservoir will enable you to make numerous espresso beverages on one fill. This is particularly handy for cappuccinos or lattes which require a lot of water for milk frothing. A built-in burr grinder ensures freshly ground coffee with each beverage. Furthermore, the full range of grind settings guarantees you will find the perfect consistency for your espresso. The spacious 8-ounce bean hopper allows you to make many beverages between bean refills. An energy efficient design makes this model safe and environmentally friendly. After 1 hour of inactivity, the unit will go into standby mode. After 3 hours it will automatically shut off altogether. The Barista Express has a sleek and durable construction. The lightweight plastic body is within a shell of stainless steel that adds both durability and elegance. Push button and dial controls make it easy to program the Barista Express. Additionally, these controls are built to last the lifetime of the machine. Versatile brew options allow you to find the perfect settings for your espresso beverage. Choose the grind setting for your beans, as well as the temperature and volume of your water. An Italian-made 15 bar pressure pump will provide silky smooth espresso shots each and every time. The beverages made with these shots will be worthy of any coffee shop! 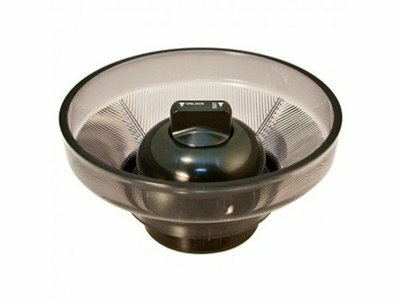 Easy to remove items, such as the drip tray, grounds bin, and coffee grinder, enable for quick and convenient cleaning. The innovative dry-puck design means that used coffee grounds are drained of virtually all water. This means you can throw the used pucks into any trash without causing a mess. Due to the manual nature of the Breville Barista Express, there is relatively little cleaning and maintenance required. A cleaning kit is included with the machine making it easy to perform all of the basic cleaning functions. 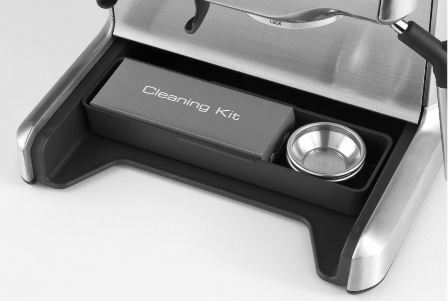 Simply lift out the easy to remove drip tray in order to rinse away any spills or residue. The used grounds drawer only needs to be emptied periodically and can be quick-rinsed to restore a shiny, new appearance. An automated warning light will advise you when to clean these items, so you don’t have to keep track. Any spills or splashes on the housing are easily cleanable with a damp cloth. Just give the machine a quick wipe to return it to its normal luster and shine. An auto purge will give the interior of the system a thorough rinsing, removing any residue or build up. The one component that needs the most cleaning is the milk wand. Any milk residue not cleaned immediately will bake onto the wand because of the wand’s hot temperature. This will create a crusty residue that will become increasingly hard to remove over time. Therefore, always clean the wand with a damp cloth after every use. Additionally, blow some steam through the wand after each use. This ensures , that no milk remains in the wand that could sour and adversely affect future beverages. When it comes to convenience, there is nothing better than an all in one brewing system. Even though the Barista Express is largely manual in nature, it is still an all in one system and that makes it comparable to super automatics. This is because it contains every component needed for creating coffee shop quality espresso beverages. The built-in grinder ensures fresh ground coffee each and every time. A large water reservoir ensures you can make numerous beverages without running dry. The 15-bar pressure pump will provide smooth, rich espresso shots for your drink. Finally, the milk steam wand enables you to create that creamy, light foam for any latte or cappuccino. Thus, from grinder to frother, the Barista Express has everything you need to make your favorite espresso drink. So put on an apron and start demonstrating your barista skills! Good coffee is the sum of several variables. First and foremost, you have to start with quality coffee beans. These beans then need to be freshly ground to the perfect consistency. Next, you need fresh, piping hot water in order to brew the best espresso shot. Finally, you need world-class milk foam for lattes, macchiatos or cappuccinos. The Breville BES870XL Barista Express provides all of these variables with its top quality components. A built-in conical burr grinder will provide the most evenly ground coffee possible. And with a full range of grind settings, you are sure to find the perfect consistency for your shots. Additionally, the Barista Express keeps water at a constant 200°F. This allows you to create coffee shop quality shots every single time. Further customizable settings, such as volume and temperature control, allow you to adjust every aspect of your beverage. This means that you don’t have to settle for standardized beverage features. A rotatable milk steam wand provides the finishing touch with world-class milk foam for any espresso or coffee beverage. Therefore, as long as you put quality beans into the bean hopper, you are guaranteed the best espresso beverage from this all in one machine. 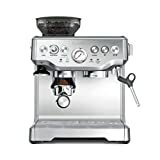 The Breville BES870XL Barista Express is the perfect machine for anyone who enjoys getting their hands dirty. Unlike most all in one brew systems that are mostly automated, the Barista Express is fully manual. This allows you to have the full barista experience whenever you make your favorite coffee beverage. Despite its manual nature, the Barista Express still offers a great range of versatility. Temperature, volume and grind control enables you to customize each and every beverage you make. All in all, it is a wonderful balance of versatility and simplicity. An excellent choice for anyone who wants to bring out their inner barista! Grind size dial: simple and intuitive, giving you control over the grind size no matter what type of bean you’re grinding.